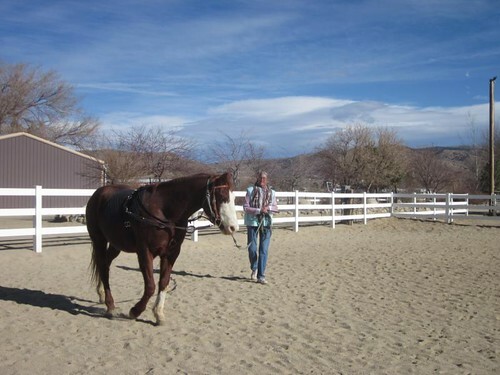 Feather Touch Ranch – No stress training for horse and rider. No stress training for horse and rider. Mid January and amid frigid temps we still manage some schooling sessions. Sage and Flicka on long rein as Amy and Kristy attempt to remain cheerful while riding in an icebox! Somehow throughout this past winter we’ve managed to at least keep to a minimal riding schedule, mostly arena work as the trails were terribly frozen over until early February. Here it is mid-March and we’re finally able to ride several days a week, solo schooling or meeting up for lessons on weekends. I guess this should be called a Quarterly Report because it seems that we’re running at least 3 or 4 months between posts on the blog! Maybe we’ll overcome writer’s block and try to publish a few paragraphs on a bi-monthly basis, but until then these brief reports will have to do. Hope our long distance friends will drop a line to say hello and tell us how they’re doing. We all miss Tammy, Judy, Becky and others who have joined the group in the past. Thinking of you and hope your families (including your horses!) are all doing well. Tea and Kathy demonstrate an excellent halt! And here’s a sneak preview from the next upcoming post. Who’s that riding Desna’s boy Strider? Hello to all our friends near and far, hope you are all doing well and that you’ve been able to spend many happy hours with your horses. I’ve been busy over the last 4 months helping some very good friends open a cafe’ thus leaving me with limited time to write a post for our blog. But I’m happy to report that training has continued and a few new riders have found their way to the our little group of enlightened equestrians. It is usually through word of mouth that people (or is it through the horses?) hear about Feather and her approach to training and they are always welcome to audit our lessons and see what exactly it is we do, not to mention how much fun we have during class! It was by a circuitous route that I finally got to meet Desna. She is an old friend of the folks whose cafe’ I’ve been managing and is also acquainted with my sister-in-law. Coincidentally, when Flicka and I left one boarding facility, Desna and her dear horse Coach moved in after me. She too left that stable and ended up boarding Coach and her new horse Strider just a few miles from where a few of us now keep our horses. But I had yet to meet her. However, she is also a good friend of our fellow horse junkie, Maggie Brown (see previous April post about Maggie and her husband Denny), so it was only a matter of time before she found her way to the group. Here she is on her fine boy, Strider. 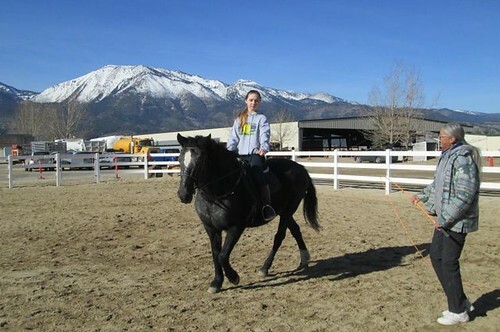 A lovely gray Arabian, he and Desna have certainly bonded in the short time he’s been in her life; it’s a joy to watch them working in class, becoming more confident as they gain the skills to continue a successful partnership. Sage found Strider to be an agreeable companion when Desna and I recently set out on a trail ride together, with Sage taking comfort in his new friend’s quiet composure. My friend Kathy and I have been bicycling together for many years, both road and mountain bikes. She has listened to me droning on and on, over many a mile, about my horses, the group lessons and how much fun I have learning the art of horsemanship. She probably got tired of me yapping away about “horses this, horses that”, but she is much too nice and never told me to just get off the subject. But you know what? Kathy has the love of horses running in her veins too and although it had been many years since she last rode, there was still a yearning in her heart to be around them again. She surprised me one day after a bike ride by asking if she could come out to the barn to see where my horses were stabled. A second visit resulted in a lesson on Tea, and now the two are in sessions on a routine basis. 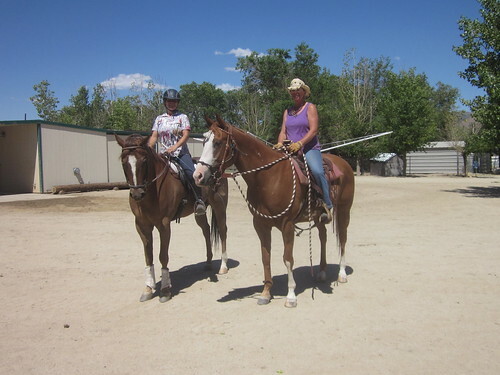 Angel and Sasha, who started taking lessons with Feather in January, have both continued throughout the year. They’ve been such a help getting the horses groomed, tacked, lunged, and enjoy classes along with the rest of us. 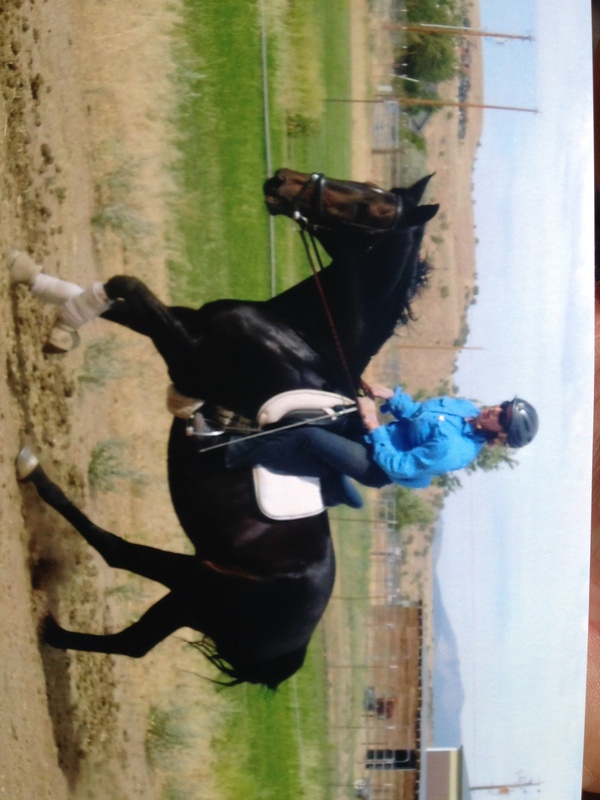 And another new friend, Becky, joined us in a class last weekend and we’re looking forward to riding with her again. She has an extensive background with horses, especially jumping and dressage, so even though it had been a few years since her last ride she rapidly fell in step with the class! I didn’t spend much time riding during the month of August, but in spite of that Sage continued his progression, showing that he makes allowances for my lapses..
As usual, having a good time! Stay well, stay warm, keep the shavings piled deep and keep your pockets filled with horsey treats! See you around the barn! My friend Chris and I have known one another for over 20 years but in all that time, although we spent many glorious days mountain biking in the nearby Sierra, we never once managed to ride our horses together. I had been thinking about Chris for several weeks and told myself I should give her a call and find out what she’s been up to over the past couple years. She beat me to it, and for some reason I wasn’t surprised when I learned she purchased a new horse last year. Like me, Chris has an older mare (Karma is 28) and was pretty content trail riding every now and then. She had not entertained the thought of getting another horse, but a new equine friend named Magic came into her life. And now she’s back into the training frame of mind. He’s a gorgeous paint, and Chris has been working with him on her own since his arrival to her home last August. Chris told me she was interested in meeting with Feather to get an evaluation of Magic and his progress. I won’t go into all the details now, and maybe (I hope!) 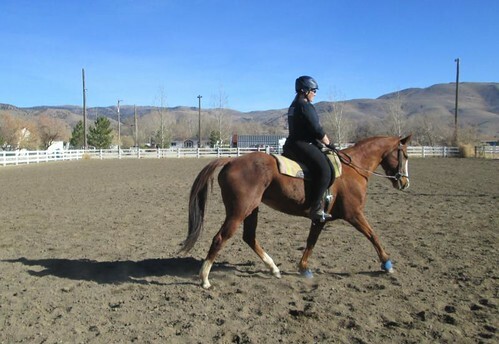 Chris will write a brief post about what thoughts were going through her mind during the evaluation of Magic during his groundwork and under saddle. Chris and Magic have made huge strides over the last month and I’ve been able to ride Sage in a few lessons with them. The “boys” get along well and Chris and I plan to do a little trail riding soon. 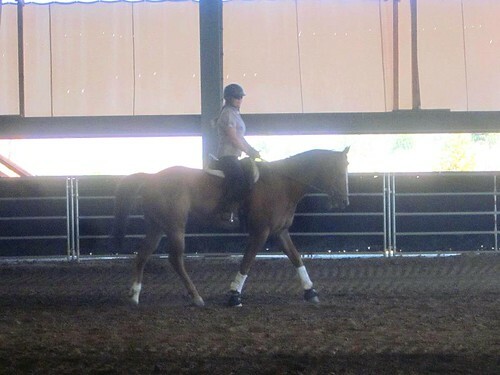 This kind of training, meaning “dressage”, is quite different from the methods as taught by many people who market themselves as trainers, so much praise to Chris for staying with it. Also, I want to congratulate Sasha for hanging in there and working so hard in her pursuit to gain a foundation in classical riding. Good job! She has been riding Flicka, who can be a real pipsqueak, Sage and also Tea. Learning to ride on many different horses is one of the surest ways to gain confidence and mastery of skills! 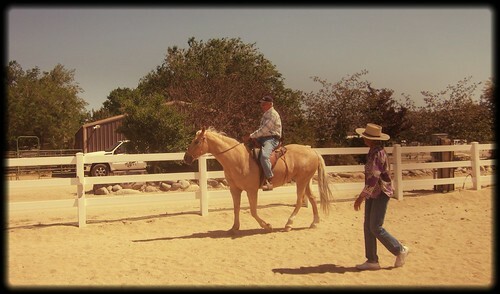 Speaking of mastery…check out the photo below of Judy and Misha at canter during a recent fun filled summer day! What a beautiful and harmonious team. I didn’t intentionally let 2 months drift by before getting around to writing this post, which was going to be a report about a private clinic that Feather gave to some nice folks who live in Silver Springs. Originally I wanted to write about the clinic while it was fresh in my mind, but alas, it is not to be. There is always so much I want to say that I get overwhelmed by the amount of time it takes to think about the lessons and write something that might be at least a little different than the previous post. I guess a reoccurring theme has been about how much I’ve learned through education in the Classical methods and how I wish more equestrians would embrace this art. I’m finding that using the term “Dressage” to novices (or even long time equestrians) can cause them to have a very specific picture of riding which they would never dream of undertaking. If you just hope for pleasant trail rides with your horse, why would you want to take a lesson in a discipline that means you enter a show ring, salute a judge, and then ride a test, all while dressed in fancy togs and sitting in a funny looking saddle? So I try to explain the term “Classical Training”, expounding the virtues of how we can help our horses become happy, healthy, obedient and safe mounts because of our own efforts to become more capable, knowledgeable riders. And it won’t matter what kind of saddle they ride in, as long as it fits their horse well. Therefore I give credit to anyone who decides they’ll at least try a lesson or two and discover what this “dressage” training is about. Which brings us back to that very hot day in April when I accompanied Feather to help out while she conducted a private clinic. Karen is a friend and riding companion of our fellow student Sherrie C, and along with her husband Dan and another couple (Daniel and Michelle) they sponsored a one day clinic with Feather to get help with problems that had cropped up with their horses. 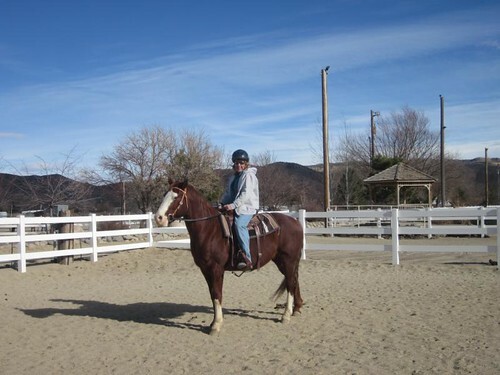 Karen has a sturdy Halflinger mare, Tigra, and a strapping mustang gelding that she recently purchased for her husband. Michelle and Daniel brought their sweet bay mustang mare Honey, who had been to a trainer awhile back, supposedly “desensitized” and able to handle any kind of scary situation without spooking. However, she did indeed shy away from something while being ridden in a paddock area, and if I recall correctly, she then bolted, whereupon Michelle took a tumble and injured her shoulder. 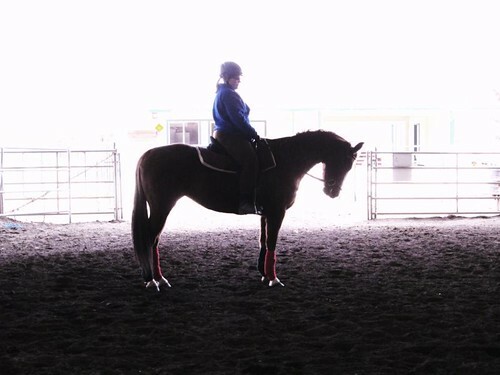 Anyone who has attended a clinic, either riding in it or auditing, knows what a huge undertaking it is for the teacher to comprehensively evaluate every horse (there were four in this one) and rider (two, Karen and Michelle). Observations are made of the smallest and seemingly unimportant details; hoof care, nutrition, tack fit, attitude at the hitching rail during grooming, liberty work, on the lunge, under saddle, and athletics of both horse and rider. There’s just so much to look for and I’m finally getting the idea of what “addressing the priority” means. As Feather watched, Tigra worked in the arena at liberty for Karen and then Feather continued with further requests for the horse such as turn on haunches to reverse, instead of allowing the mare to turn her rear to the middle before changing direction. Tigra seemed to enjoy the work, showing off and definitely loving the praise she received for her performance. 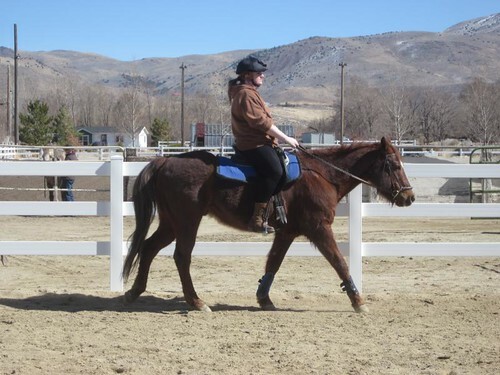 This is one smart mare and she is most likely a very reliable mount who would be happier when her human mom can learn to become a quiet and patient rider. Tigra has figured out what to do to intimidate her mom, therefore Feather asked Sherrie C to climb into the saddle for a little work before putting Karen on her. Next thing, I was being asked to ride Honey, who had already worked on the lunge for Feather; Honey is a cautious horse, and it was apparent that she has had some hard times in her past ( Michelle essentially rescued her from a bad situation). Feather talked to Michelle and Danielle about upping Honey’s daily food intake because she was on the thin side, and probably in need of special supplements along with extra calories to get her in better condition. She had a recent vet check and teeth float, so it’s possible her tendency to worry may hinder the absorption of nutrients from her food. I felt that Honey had retreated inward, sort of like Sage was in the beginning of his training. Too many things have happened in her life that were unpleasant, and horses like Honey and Sage seem to not act out in anger like another horse would (imagine Flicka if she had been mistreated…. ), but instead find other ways to become defensive. Feather told me to just “do nothing, don’t ask her to flex, keep a light rein, stay quiet and let her find out that you will not hurt her”. okay, that’s the old “do less” mantra. 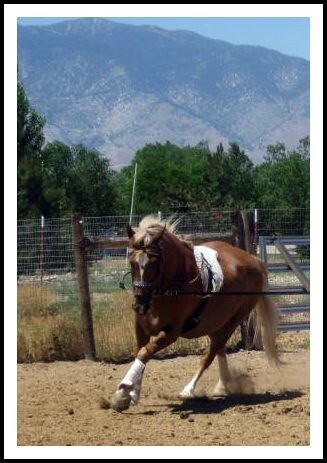 Honey had a very short, stiff stride, but after a few times around the arena she began to warm up and stretch out as best she could. My leg stayed quietly “on” her and soon she was comfortably walking with no concern that I would be abrupt. At the request for halt, Feather reminded me to exhale while softly closing leg and seat; Honey obediently halted and never tried to pull through the reins. I had an intense feeling that she was happy to finally have a human who was patient and quiet. Then the call for “Half Turn Left on the Forehand”. Well. It was clear that Honey had no idea what this move was, but there was the ever present voice (Feather) in my ear, “ride the horse as if he knows the move”. Applying the aid, I requested the turn on forehand, expected little, and….she slowly but very surely managed a brilliant turn on forehand! I heard Danielle and Michelle ask Feather how come Honey understood what I had asked her to do. How do you explain that this is what Classical training is about? Honey gave me the best lesson that day. I was very proud of her and I hope she continues to find a safe, comfortable and happy home with Michelle and Danielle. 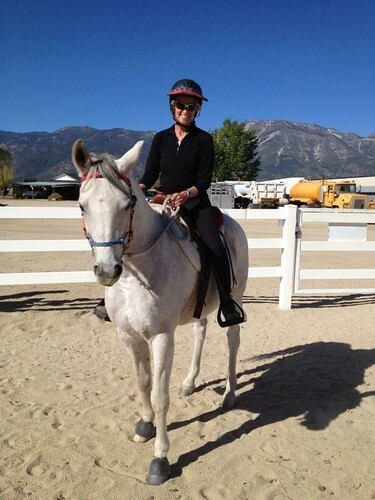 Sherri also rode Karen’s new mustang gelding. She said to her friends, “I trust Feather and know she wouldn’t put me on a horse if I wouldn’t be safe”. Sherri rode beautifully. 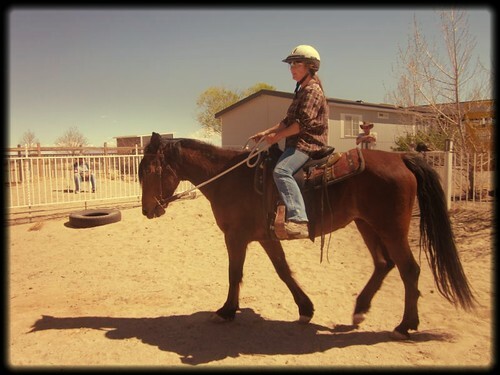 All the skills she has gained showed in her confidence and ability to ride a horse she was unfamiliar with. She is “riding every horse the same”. Good job, Sherri! 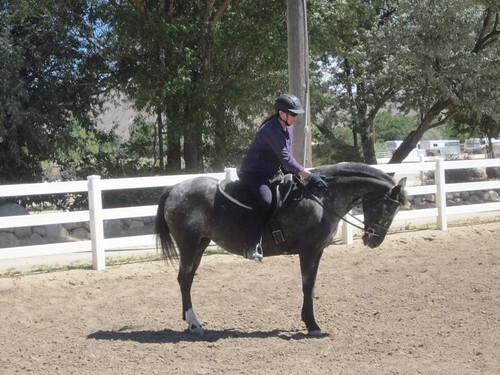 After Sherri had warmed up Tigra, she dismounted and handed the mare over to Karen, who next rode under Feather’s ever perceptive eye, and last, Michelle received a lesson while also riding this versatile horse. Tigra worked admirably for each person during their individual evaluations. All of us were wilting by the end of the day, so we sat in the shade with cool refreshments, discussing what these folks could do to continue working effectively with their horses. Simplify, be consistent, don’t rush, take the time to just BE with your horse even if it’s only grooming them for 15 minutes. Never worry that you’re not doing enough, we usually do too much. Wouldn’t it be nice to start off on the right path with horses from the very beginning? The lucky young lady in the photo below gets to do just that! Maddie has been visiting Judy every other week to learn all about horses, their care, management, and the best part, how to ride. I found Maddie to be far more mature beyond her 10 years, taking instructions well and following through in a competent manner. She helps clean the stalls (at her age I would’ve skipped right over that chore), groom each horse, pick out the hooves, and then helps get the amazing Chief Ten Bears tacked for her riding lesson. 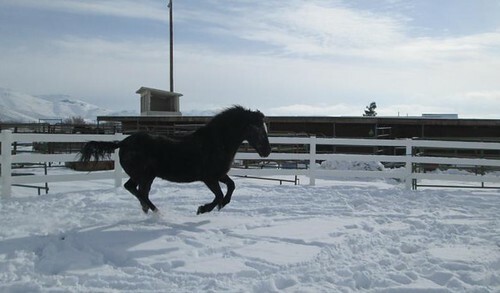 She is also learning how to do groundwork, at liberty and on the lunge. What an excellent start! The fellow in the photo below isn’t as lucky as Maddie. Here he gets instruction from Feather in how to correct his position and quit squishing baby birds under his legs. He’s been riding horses for many years, but as we all know, there is so much we don’t know! And it’s definitely difficult to step over to the right path when we’re older…but it’s never too late to start, especially for the horses’ sake. 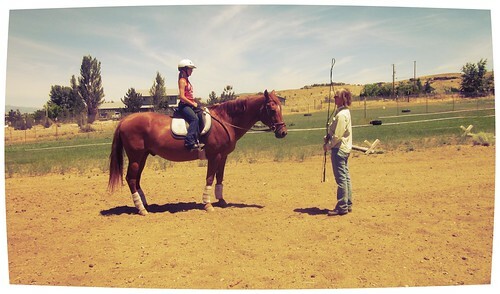 A few weeks ago, after my lesson on Flicka, Amy asked me if I had had fun. Well, I remember a long pause before I finally replied “yes”. Upon thinking about that moment I have come to the conclusion that for me riding, and in particular riding dressage, is “fun” when that light bulb clicks on and you know the feeling of getting something right. Dressage is fun when you really understand what is being taught, when you can correctly use what is being taught, and when you give the horse those correct aides. That particular lesson started out badly for me. I felt frustrated because I was riding incorrectly. I still feel very new to dressage. I have not had much consistency until now and that is part of my problem. The rest is all me. As Feather said to me one day “we are dyslexic when it comes to dressage”, at least in the beginning. I do still have some fear associated with riding and maybe that is part of my problem. If the wind is up, I get nervous. If the horse tosses her head, I get nervous, or if either one of us is distracted, I get nervous. We all know, if the rider is nervous, the horse is likely to be as well. Or…. The rider gets the aides wrong and the horse responds… Well, you get the idea. Anyway, that lesson ended on a good note and the lessons since then have started out better and ended very well. I have learned a lot since that day. Like anything else worth doing, dressage is hard work and can be very fun” Dressage is something I want to do because I love horses and want to be a competent rider. I’m looking a bit smug, but at least Sage pays attention to Feather! 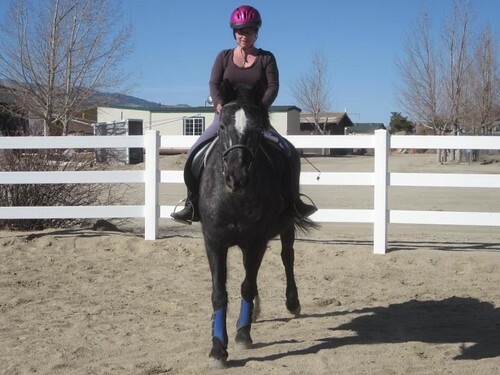 I became hooked on the Classical approach to riding and training after the very first session I had with Feather. And although I’ve written previous posts about that day (and the many lessons that soon followed) I find it helpful to review those initial days in the ring when everything I was learning seemed so foreign, yet at the same time made so much sense. I tend to forget how arduous it was to correct my poor position, or the confusion I had when asking for a simple half turn on forehand, my frustration when I couldn’t attain a lovely square halt from Flicka. Although I had many years of horse ownership, hours of saddle-time, and had read a plenitude of books, I had absolutely no inkling of what real communication between horse and rider meant. It wasn’t easy to begin this new (to me) way of “Riding”, in fact it would have been far easier to have continued being a passenger upon the back of my horse, ignorant of what could be achieved by acquiring a higher education. Every small step forward led to the next plateau in knowledge, skill and confidence. Discovering the philosophy, principals and structure of Classical Riding opened a new and exciting path, providing a harmonious and gratifying relationship with each horse I ride. Sasha and Flicka make such a cute team! Enough said. It is with much happiness that I can report there truly are people who DO want to build a solid foundation and acquire the skills to ride with a quiet mind and body. I’d like to formally welcome both Angel and Sasha to the Feathertouchranch weblog. They have been riding in classes for the past several weeks and I’m only now getting around to posting the photos of those sessions. 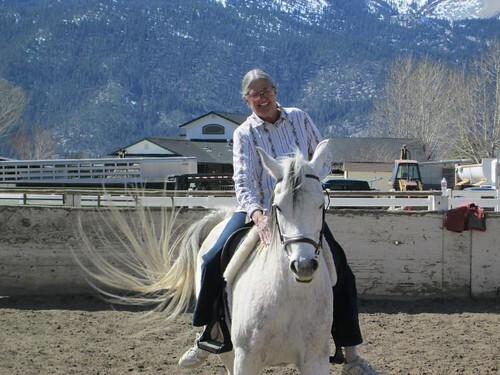 Both women were looking for a dressage instructor and came across our blog; I’m fairly certain they found the link to Mr Chuck Grant, who was our teacher’s teacher, which says so much about the classical traditions passed on to us during our own lessons. 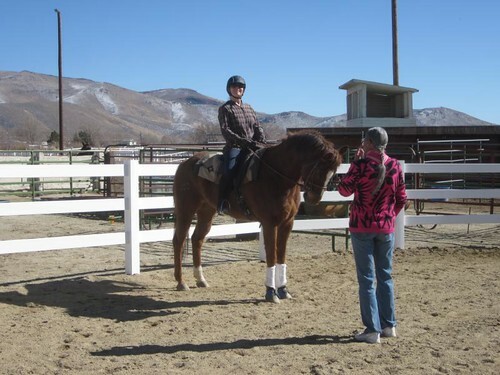 Beverly and her horse Jiggs joined the group class for a few sessions and we hope she found it rewarding, not overwhelming. Lindsay is another new student, coming from a hunter-jumper background, who has quickly embraced dressage, and particularly enjoys the new skill she is developing by learning how to incorporate correct groundwork in the training of our horses (she responded, when asked if she had ever worked a horse on the lunge, “welllll, we used to hook a lunge line to their halter and have them run around as fast as they could until they were warmed up. Then we’d tack up and gallop them over the jumps!”). Angel is getting a nice walk stride from Breeze; these two established a bond from the first day! So, kudos to all these ladies for giving this a try. 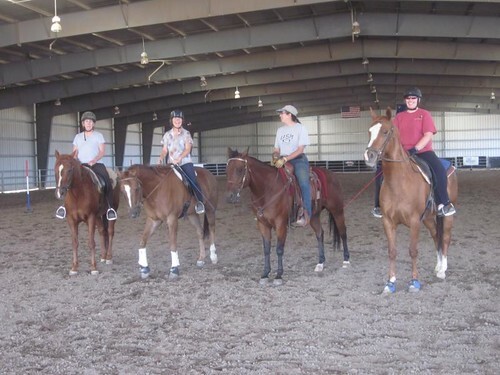 It’s very, very difficult to join a group of riders, even a small group, and not feel some apprehension about being the new student in class, riding an unfamiliar school horse or even their own horse who has never been in this kind of training session. The student may ask herself afterward, “why did we walk, halt, walk, for most of the session, and we only trotted a little? Why didn’t we canter?” and on and on. So many questions run through our minds. When I reflect upon my first classes I remember wondering, “where do we go from here, what’s next?”. It took awhile before I understood why I needed to learn to keep a straight horse, why we spent time at the beginning of each session asking our horse to stretch and walk on, why the quality of the walk was so important. Our teacher has said, as upheld in the Classical method, “one does not get quality work by practicing poor gaits”. A person unfamiliar with dressage may observe a session and think it is the most boring thing to do with a horse, not very exciting at all! I read a quote somewhere online, that dressage is like “the slow food movement, nothing is rushed, every little step is savored”. I like that analogy. This is truly natural horsemanship, and over time we find that because of our newly honed powers of observation we are more likely than others to spot lameness issues, we even look at hooves in a new way, checking to see if they are balanced, even and level. Proper tack fitting becomes a priority, and we become acutely aware of poor riding skills (no matter what the discipline may be). We’ve learned that short cuts all too often lead to disastrous results. This is not to say that we can’t have fun when we ride and train, in fact, because we are empowered by knowledge and have developed fundamental skills, I believe riding is more fun than ever! Every so often I’m going to include links to other websites and blogs that have helpful articles. The following link is a page on the Artisticdressage blog, with quotes by Melissa Simms, a protege of Egon Von Neindorff, on the philosophical aspects of classical training. I especially love her thoughtful observations regarding our responsibilities and duties that our horses deserve to receive from us. 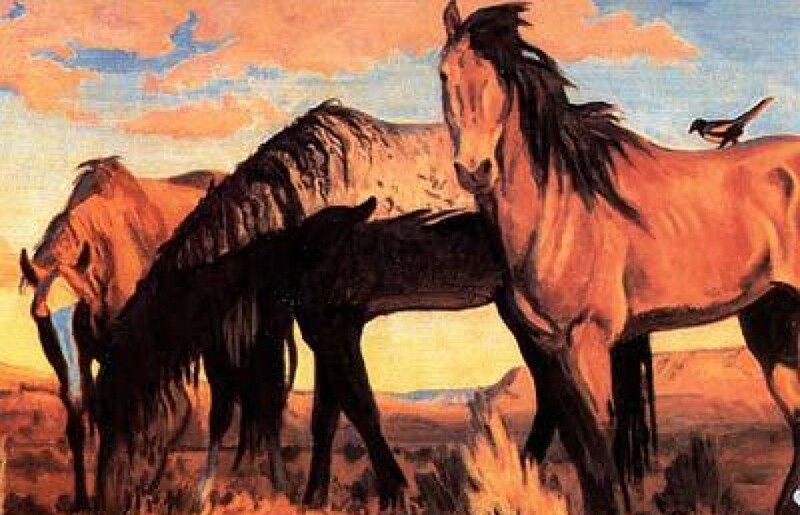 In closing, I also want to say how inspiring it is to see that the members of our group have developed such strong friendships and camaraderie over the years – the compassion and concern we have for one another, our families, our horses (and all our animal companions) becomes so apparent when we pull together during difficult times. We are grieving with our dear friend Judy, and extend our most heartfelt sympathy to her, in the loss of her wonderful, brilliant horse, Moose. His spirit gallops across blue skies, watching us from afar as we continue upon our quest to be thoughtful, caring and compassionate equestrians. Godspeed, Moose. I’m pretty sure almost every equestrian has been been in the position of being puzzled, perplexed and frustrated when their horse reacts and evades our requests, turning a deaf “ear” to our aids and marching on (or in some cases, not budging an inch) to his own tune. I know I’ve been there, and I remember the consternation it caused me, wondering how I could resolve the problem without causing harm to either myself or my horse. Once we gain a good foundation from our education in the classical approach to horsemanship, we soon find almost all problems can be corrected by using the new skills we’ve developed. We also find that it becomes easier to spot difficulties that others may be having with their horses, noticing the little things that should be corrected with patience and practical application of correct training methods for both horse and rider. It’s been a genuine pleasure to meet Jan and her horses Wiseguy and Boss. Wiseguy is a sweet, itty bitty miniature horse that Jan has had lots of fun with, he has a special little cart that he can easily pull, and it must be a blast to take a tour of the ranch from this view! I hope I get to watch the two of them in action this coming Spring. Boss is her new, very first, full size riding horse, and she has spent the last couple months getting to know him better and forming a bond. A smart lady, she took riding lessons before buying a horse and continues to hone her skills as she rides and works with him, visiting him at the stable almost every day. 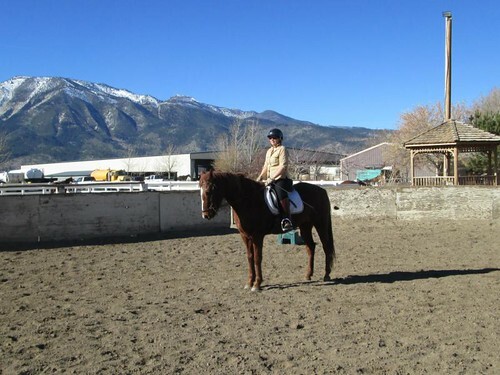 Her goal is to be able to ride comfortably and safely on the nearby trails, to have a good relationship with her horse, knowing he is trustworthy, obedient and happy. Flicka and I went on a little arena ride with Jan and Boss, the first loop around the ring went fairly well, but soon he was acting a bit naughty, nothing horrid, but rather resistant and uncompromising. I offered to get on Boss just to see for myself exactly what he was doing under saddle. Within a few strides I was pretty well convinced of what was going on…that old evasive move that Flicka loved to pull on me, yep, the stiff neck, shoulder out, “gotcha in the corner” move. I learned from Feather how to correct this problem before the horse goes crooked, but even with that knowledge I still appreciate how GOOD horses are at evading us. Boss caught me off guard several times before I could fix him and keep him straight. Phew, I thought, “this needs to be fixed soon, before it becomes a real problem”. I told Jan that this was no fault of hers. Like all horses, Boss has found an evasive tactic that worked and allowed him to make the decisions. He says to her, “I’m done working and I don’t want to do this anymore”. I mentioned to Jan that she might want to read a few of the posts on this blog, specifically a couple posts by Tammy and Sherrie C, just so she could see that her situation isn’t unique and all of us have been in her position at one time or another. And then Feather offered to give a brief evaluation of Boss on the day she was coming over to help me with Sage’s training. 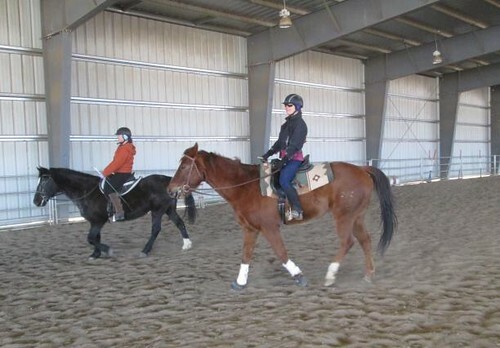 As Judy, Cherie, Jan and I looked on, Feather worked with Boss on the lunge line, side reins attached to surcingle. He’s a smart boy and soon figured out that nothing harmful would occur, and presently he gave a nice marching walk, his stride lengthening as he relaxed and loosened his back muscles. Trot was also asked for and again he was soon moving out of the short, choppy jog and into a better rhythm with lengthened stride. Jan observed and had several questions that Judy adeptly answered, and as usual, Feather kept Boss quietly moving around her, even as she gave us commentary on what she was asking and looking for as he responded to her requests. I want to mention that there is a great little book titled, “The Art of Lungeing”, by Sylvia Stanier (it can be purchased online), and reading through sections of it tonight, I’m struck by how closely it coincides with the way Feather has instructed us during our groundwork classes. 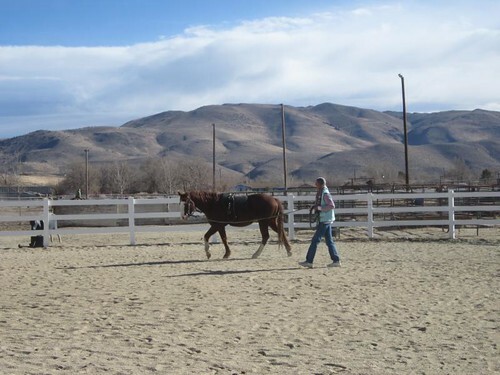 There is so much that we can do for our horses, and ourselves, through excellent groundwork. 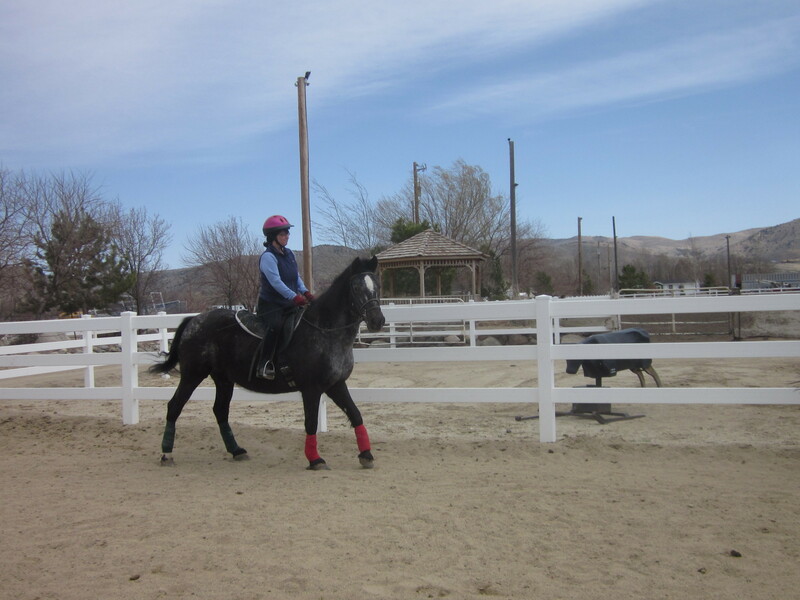 After the lunge line work, Feather surprised Jan by asking her if she had time for a brief lesson in the saddle. Heehee! She’s good at pulling that one! Better too, Judy, Cherie and I all got to join in for a quick, mini-group lesson. We had fun, I hope Jan had a good time too, but best of all was that even though all of us are a bit rusty, our horses all got into the swing of things and we had a great little refresher course just working at walk, halt and even a tad bit of shoulder-in. I wonder what Boss thought about being in a Feather Touch class? ps: Feather asked me to remind Jan, “Keep it simple, straight, and even”. I think we know what she means by that, but if anyone else would like to explain these rudiments to Jan even further, please do so in the comments at the bottom. Thanks!